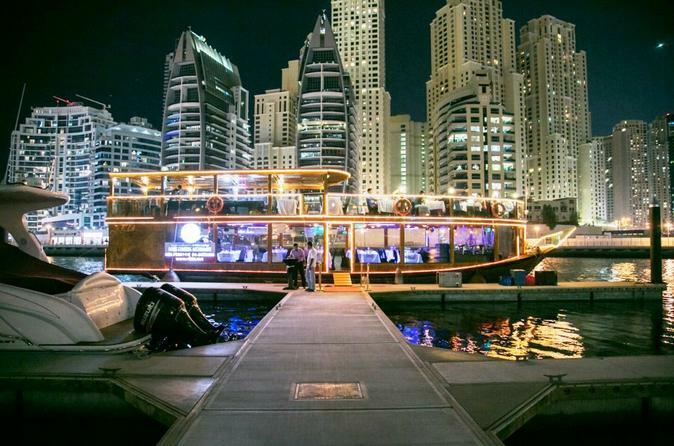 Relax over dinner and admire the illuminated sights of Dubai Marina on this 2-hour cruise aboard an elegant ‘dhow’ — a traditional Arabian boat. Be welcomed onto the gorgeous wooden craft and savor a scrumptious buffet dinner on deck or in the panoramic cabin as you sail around the marina. Drink in the views of the surrounding skyscrapers and landmarks, including Dubai Marina Mall, all beautifully lit up against the night sky; and enjoy a dazzling ‘tanoura’ performance of whirling-dervish style dance as you eat, adding an extra touch of magic to the occasion.